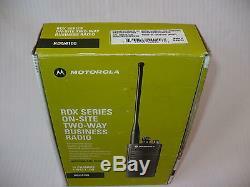 Here is a very nice Motorola RDX Series model RDU4100 UHF professional two way radio. This radios is a 4 watt, 10 channel, UHF model. 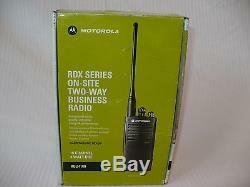 This radio is equipped with the Motorola high capacity battery which is a much better battery than you receive with the two watt RDX radios. These are professional grade radios and constructed to take the rigors of industrial use. These radios are capable of utilizing voice activated transmit accessories for hands free operation (accessories not included). They are also capable of scanning all 10 channels. 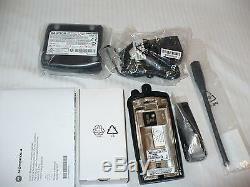 These items have been removed from the package for testing and photographs and the packaging is not in showroom condition. The user can also select a program with an interference eliminator code. There are many of these codes to choose from which minimize static, noise, and unwanted chatter. When you operate on a frequency with a code set, you block out most interference on the frequency. For compatibility with radios that do not have codes the radio can be set to code off while programming. You can see programming instruction along with the entire owners manual by clicking here. Here is what is included in this package. Everything that you see in the pictures (which are the actual items you will receive) which includes. 1 Motorola model RDU4100 radio equipped with the. Motorola Ultra High Capacity Battery. Please note that these are not the same batteries that come with the 2 watt RDX radios. These are capable of providing up to 18.5 hours of battery life compared to the 12 hour rated standard Lithium-Ion batteries. 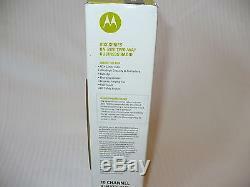 1 Motorola drop-in desktop charging stand with power supply. These radios are tough, durable and dependable. We have personally seen RDX radios endure some of the harshest industrial environments. Their durability is truly impressive. Rigorous testing in the design process using U. C, D, E and F Standardsso you can be confident theyll hold. These tests simulate the very. Steady rainfall and wind for 30 minutes on. Up to nine hours of exposure to vibration. Simulating the rigors a radio could undergo while being carried. Six hours of blowing dust on all surfaces. 18 shocks with a minimum G force of 40 G each. Multiple hours of exposure to storage. Temperatures as low as -67° F and as high as 160° F.
Exceptionally Clear Audio & Suitable for Noisy Environments. The RDX Series brings workplace noise to its knees by helping to ensure exceptional audio quality in the loudest environments. Crisp, clear audio is essential to your communications and. The RDX Series delivers audio that is 30% louder than previous models. Speaker magnetic field reduction, wind-noise reduction and. Improved RF specifications contribute to the premium audio quality. Durable and Water Resistant for Everyday Use. Manufactured with a durable metal diecast chassis, the. RDX Series holds up under demanding industrial conditions. And meets Military 810 C, D, E, F and IP54/55 specifications. For shock, rain, humidity, salt fog, vibration, sand/dust. Temperature shock, plus high and low temperature. 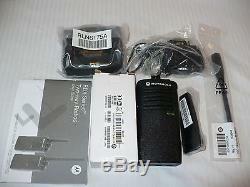 The RDX two-way radio series is 2013 FCC Narrowband ready. These radios are programmed to operate in 12.5 kHz efficiency. Interfacing with the RDX Series radios is easier than ever. CPS software will allow users to perform programming. Functions and provides access to new features such as Reverse. Burst to eliminate unwanted noise, Detail Reporting to manage. Radio profiles, CPS Manager Lock, Transmit Power Select, PL/. DPL customization, Time-Out Timer, and much more. Available as a free internet download. Cable is required but is not included in this sale. Capability and will program your radios for free with this sale. The 4 Watt models cover up to 350,000 sq. An easy-to-use drop-in charger keeps radios charged, ready. The custom RDX Series Li-Ion battery packs are designed and. Manufactured for optimum durability with the radio. 4 Watt radios feature the ultra-high capacity battery. (up to 18.5 hrs). An alkaline battery kit (not included) is available as an optional accessory (up to 26 hrs). The RDX Series radios operate on 89 UHF. By model and feature 219 codes, including customized PL and. DPL codes to help ensure a clear signal. A convenient, tri-color LED interface lets you easily identify. Different radio features and radio status. You can quickly copy settings from radio to radio with either. The Radio-to-Radio Cloning Cable or the Multi-Unit Charger. Enjoy the convenience of hands-free operation when you use. Coverage will vary based on terrain, conditions and the radio model used. Battery save feature must be activated for optimal battery life. For a complete list of available frequencies. You can find complete information about the capabilities of these radios by clicking here. There you have it, everything that you need to communicate effectively packaged in a rugged design. Please take a moment to look at our. If you need more radios or radio accessories, please check our. Please let us know if you have any questions. We can generally respond within a few hours. Expensive items will be insured and require a signature. We absolutely try to under promise and over deliver for our customers every time. This item only ships to the United States. We guarantee that all merchandise we sell will arrive in working order and as described. Purchaser is responsible for product licensing if required. 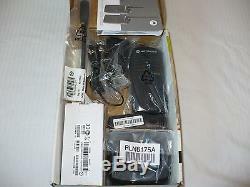 The item "Motorola RDU4100 radio 4 watt 10 channel UHF RDX 2 way radio walkie talkie" is in sale since Sunday, January 24, 2016. 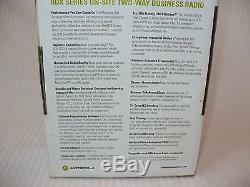 This item is in the category "Business & Industrial\MRO & Industrial Supply\Commercial Radios\Two-Way Radios". 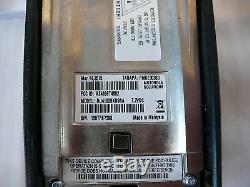 The seller is "torquester2000" and is located in Whitewood, South Dakota.